Face Doctor is a famous and a reliable name for herbal Chinese rejuvenating & medicated soaps, beauty creams and cosmetics. After more than 30 years of medical research, a team of Chinese doctors isolated a small parasite called Human Demodex that caused people's complexions to become rough, lumpy and reddish. The parasite resembles a microscopic worm that feeds off the skin and is light sensitive. 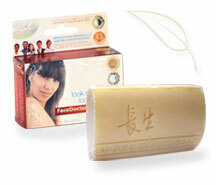 Face Doctor Herbal Beauty Soap was developed to counter the effects of this tiny parasite. The all-natural soap isn't like ordinary medicated soaps. It uses the oil from the ancient seabuckthorn herb found in Tibet to effectively correct bad complexions from the inside out. It was awarded the 14th Annual Salon International Award for inventions in Geneva, Switzerland. Face Doctor Soaps are made from natural plant extracts that were developed to deal with the causes of ugly skin such as redness, enlarged pores, acne, skin blotches, rosacea and premature aging. They have cleansing effects too. Similarly, facial cream product acts as a moisturizer and has the same active ingredient found in the soap. Antibacterial Shampoo and Conditioner will leave your hair extremely smooth and silky. The conditioner will be the ideal hair conditioner to use right after using their award winning shampoo. Face Doctor Products Dramatically Reduces Redness Caused by Rosacea. An independent double-blind placebo study conducted by Dr. Neil Bhatia, Assistant Clinical Professor of Dermatology at the University of California San Diego School of Medicine, clinically proves that Face Doctor Products, a line of skin and hair products containing a proprietary blend of Seabuck Thorn Oil, Vitamin E, Aloe and other key ingredients, dramatically reduces redness and inflammation caused by rosacea, dermatitis and acne. According to Web site www.rosacea.org, more than 14 million Americans suffer from rosacea or “red face” and other debilitating skin ailments that detrimentally affect the quality of their lives and overall lifestyle. Placebo study: A double-blinded placebo-driven study on a select group of patients with the diagnoses of Rosacea. Dermatologists Breakthrough Study in the Fight Against Acne & Rosacea: How does human demodex reproduce and live in the skin? Medical white paper on rosacea: There's more to the red face than meets the eye! What is Rosacea? 15 Million Americans & Canadians Have Rosacea And Most Don't Know It. Facedoctor Products Dramatically Reduces Redness Caused by Rosacea. Key ingredient Seabuck Thorn kills mites that cause Rosacea. Is human Demodex effecting your skin? Human Demodex is a parasite that lives in the human hair follicle. News Report: Backed with 30 years Clinical Reasearch Acne/Rosacea/Psoriasis/Eczema cause Identified. Eyelash Creatures: Demodex folliculorum, or the demodicid, is a tiny mite, less than 0.4 mm long, that lives in your pores. Featured Article in Oxygen Magazine: Is your Workout giving you zits? Examination of Demodex- How do we detect demodex? What is Demodex Infectiosity? What are the Differences Between Demodex Infectiosity and Incidence of Demodex?